Look up at the night sky to see countless wonders: planets, stars, nebulae, galaxies, and more. Almost every point of light you see above, every faint fuzzy in the heavens, and every constellation is located in our galactic home. With the exception of three objects, everything you observe with the unaided eye exists within our own Milky Way Galaxy. Those three exceptions are our topic for the week. There are about 2000 stars for the amateur observer to enjoy on an average night.2 All heavenly bodies observed in the northern hemisphere, save one, exist right here in our own galaxy. Sitting off the knee of the constellation Andromeda is M31, or the Andromeda Galaxy. Our closest major galactic neighbor, it is spiral in shape like the Milky Way. With a rather bright magnitude, this soft fuzzy can be seen with the naked eye in dark sky conditions. Find it by following Alpha Cassiopeiae, one of the brightest stars of the constellation, downward towards Nu Andromedae. 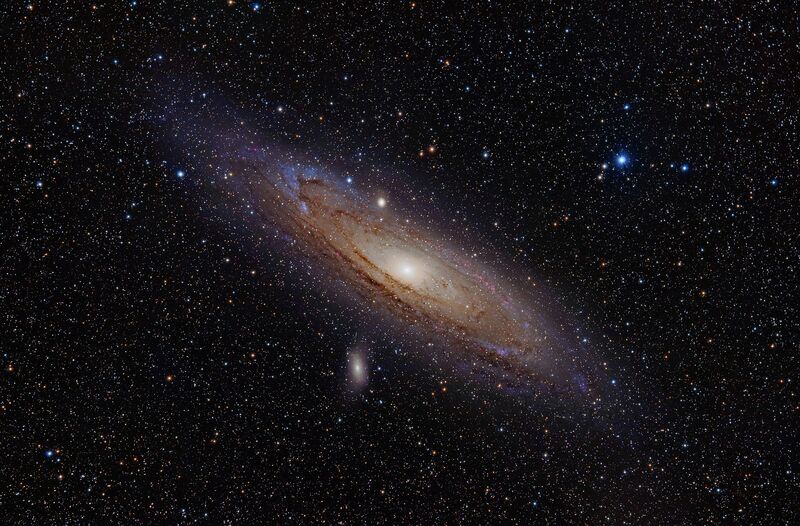 Don’t let her faintness fool you—the Andromeda Galaxy is the largest of our local group of galaxies, at over 200 thousand light years from end to end. It is considerably denser than the Milky Way, with twice as many stars. Two similar features exist in the southern hemisphere. Nesting between Dorado (the dolphinfish) and Mensa (the table), is the Large Magellanic Cloud (LMC). Classified as a spiral dwarf galaxy, it is one of the closest neighbors to the Milky Way, at only 163 thousand light years away. Scientists hypothesize that the LMC was a barred spiral galaxy before it was impacted by gravitational forces from our galaxy.3 The LMC is quite obvious against the backdrop of stars— look for it off the tail of Dorado. With its disrupted spiral arms and large gas clouds, it differs from typical galaxies observed through a telescope. Our universe holds many amazing wonders to enjoy from our own backyards. One only needs a little information and the desire to look!